Hoochie Coochie Man - The Vocals!!! There's no questioning the power of Muddy's vocals on Hoochie Coochie Man, but how can we think about vocals beyond acknowledging their impact? Our man Highway RickEy has a fascinating idea which is to study the rhythmic "shape" of how he sings phrases. RickEy's chart of the vocals illustrates two things - the circles nail down where beat 2 is and the quirkly lines at the ends of lines are diagrams of where Muddy's vocal intonation goes at the ends of the phrases. Knowing where beat 2 is and, Shoji would recommend, also beat 3 is important because as we pointed out earlier, the vocalist is in the clear here and needs to stay rhythmically solid so the band knows when to roll back in. 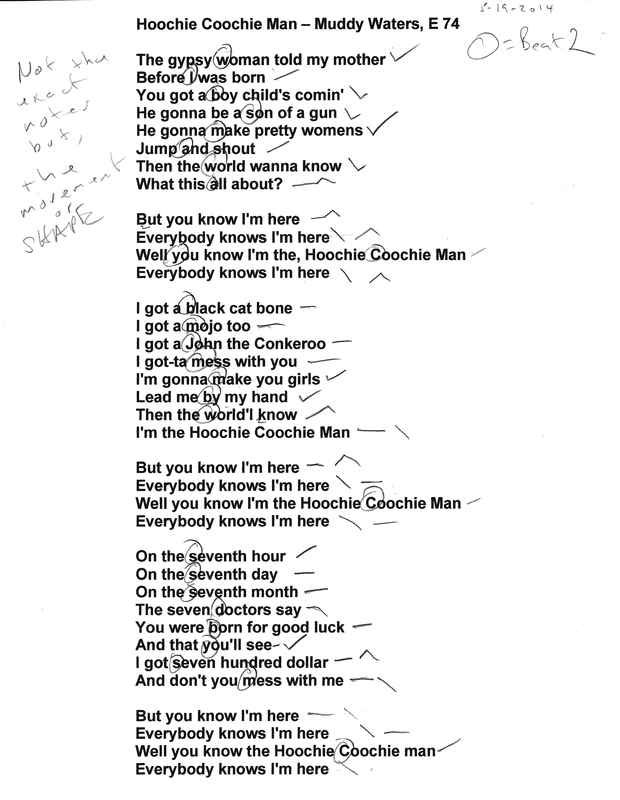 You can't take rhythmic liberties and have this tune come off well and studying Muddy's precision here is important. Now play back the tune and watch the line diagrams and you'll see that Muddy varies his intonation, sometimes holding a straight line at the end of the phrase with no upward or downward inflection, and other times his voice rises or falls. Singing needs to hold more than just the words - the emotion is in the tone and inflection - so study Muddy's mastery here! Note that RickEy's chart here is for the alternate take. Jason McInnes In New York Times!!! Our B1 friend Jason McInnes and his band the Wren & the Whistler were featured in an article in last Sunday's New York Times. Check it out here and congrats Jason! Shoji Naito Launches New Website!!! No class next Monday - fire up the grill and enjoy the holiday!